Previously published under the title "Psychotronics Book 1", this volume is a collection of essays that serve to provide new researchers with an overview of the field of Psychotronics, radionics, and scalar energy. Much of the information in this book is directly applicable to other two-dial analyzers, including Hieronymus, Rogers, Mattioda and Lightning devices. A Kelly Research Technologies exclusive! 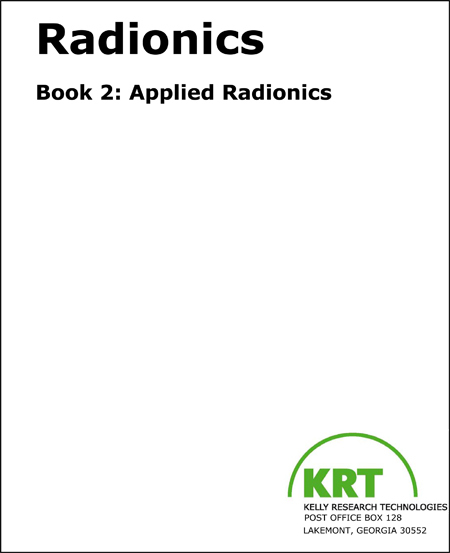 Take control of your energetic destiny with this hands-on manual featuring step-by-step instructions for safe and succesful use of all KRT radionic analyzers and potentizers, as well as advanced strategies, techniques and topics. This book is the result of more than 35 years of compiling, collecting, and creating radionic rates for two-dial instruments. A reference volume for use in energetic research, this database includes more than 13,800 rates and is sorted alphabetically. Ideal for for use with all Kelly instruments, as well as all Hieronymus, Rogers, Mattioda, Lightning and SE-5 radionic devices. DISCLAIMER: Publication and distribution of the ideas, theories, concepts, descriptions, processes or instructions published in this book in no way represents or constitutes a claim that any product, system, or device manufactured or offered by Kelly Research Technologies, Inc., nor any other scalar, radionic, psychotronic, or free energy device, can have a positive, negative or any other impact on human health, or is in any way a replacement for or supplement to the advice or treatment provided by local, state and/or federally licensed medical and other commonly recognized allied health care professionals. Kelly Research Technologies’ radionic instruments, analyzers and accessories are intended for agricultural and energetic research only and can in no way diagnose, treat or prevent any human medical condition from occurring. More specifically, Federal law states that only a medical doctor and/or prescription drug is/are able to diagnose, treat, prevent, or cure disease. All information and all correspondence verbally, via email, brochure, letter or otherwise does in no way make any claims to diagnose, treat, prevent or cure any ailment, affliction, suffering, or disease that any person(s) have had, currently have, or will have in the future. It is always recommended to discuss with your medical doctor prior to making any changes in diet, nutrition, supplementation and exercise. If you are in need of medical or mental health care please contact a licensed professional! COPYRIGHT 2018 by Kelly Research Technologies, Inc. : All rights reserved. See each book for additional copyright information. Yes, I agree! 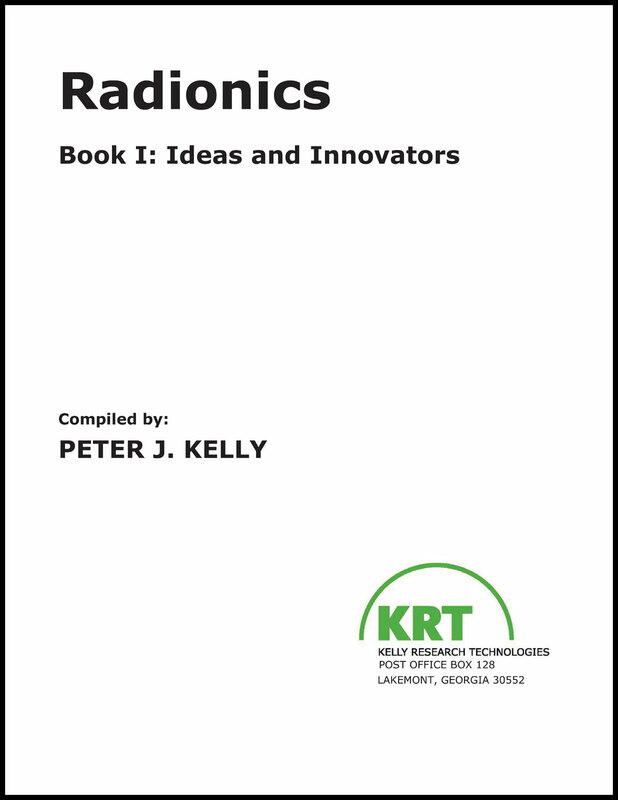 Click here to view and/or download Radionics Book 1: Ideas & Innovators. Yes, I agree! Click here to view and/or download Radionics Book 2: Applied Radionics. Yes, I agree! 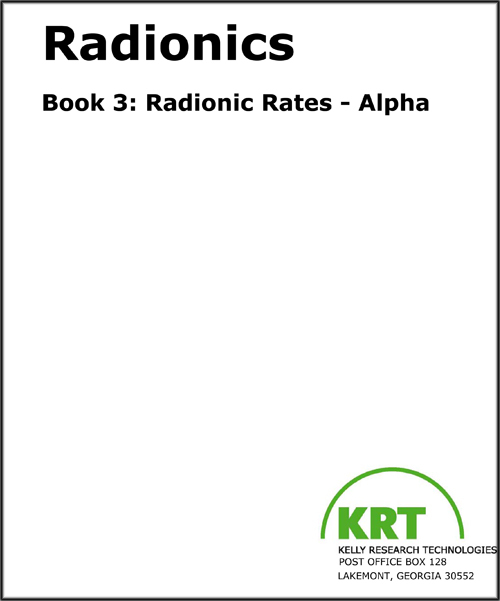 Click here to view and/or download Radionics Book 3: Radionic Rates - Alpha. I do not agree. Click here to return to return to the KRT home page. Electronic books provided in Adobe PDF format. Click here to download the free Reader software by Adobe. Copyright 2018, Kelly Research Technologies, Inc.